If you’re buying a Euro zone property, and you have British Pounds to exchange, then now may be a good time for you. The British Pound has been slowly gaining in strength against the euro, since the 31st of October, 2013, when it bottomed out at £1 to €1.16735. What difference does this make to a buyer who has British Pounds? If you are intending on buying a property in Portugal or Spain, the average €250,000 purchase has just got €9267 cheaper since the end of October. 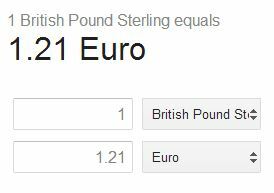 The Pound has almost reached €1.21 today, and is currently trading at €1.20442. If you had bought a Euro priced property at the end of October, you would have only got €116,735 for your £100,000. If you sold £100,000 today, you would get €120,442. A difference of €3707. When you relate that to a property purchase at €250,000, it makes an enormous difference. 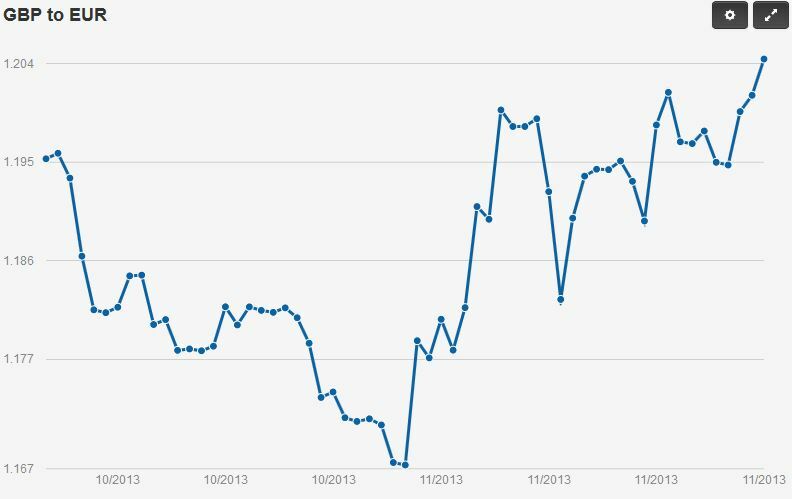 “What goes up, must come down…” As you can see from the graph below, you will see that the rates go up AND down. If the rates drop by the same amount, you will lose over €9,000 and your property just got a load more expensive. What can you do now to secure the current great rates? Register with FX-Foreignexchange now, for free. You can then fix the current rate of exchange with only a 10% deposit. This is called a “forward contract”. You can then be assured that the rate is fixed for the agreed period of the contract and your purchase price won’t change because of the exchange rates.